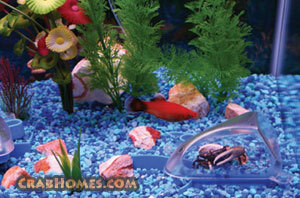 Did you know that you can get a crab terrarium at the bottom of your fish tank? Your crabs can live in their natural habitat while still maintaining their semi aquatic life style. A terrarium is "A small enclosure or closed container in which selected living plants and sometimes small land animals, such as turtles and lizards, are kept and observed." Well, we have figured out a way to put a terrarium in your fish tank so that your crabs, turtles, newts and any semi aquatic animal can live naturally in its own habitat. In this crab terrarium they can breath the necessary air that they need to survive, they can eat the food that they need and they can take some time out and just go rest on dry land. Before we invented the crab terrarium called Atlantis Underwater Island, This was not even possible. People would have to keep their crabs, newts, salamanders and turtles completely separate from their normal fish tank. In our opinion, this is a waist of time, space and money. With our crab terrarium you can enjoy watching these animals all day long. It is so rewarding to see your turtle take a rest after it has been out for a long swim. All it has to do so that it can enter the crab terrarium is to swim to the bottom of the tank and use the rocks at the bottom to get up into the air filled, dry land. Using the pump that is already in your fish tank, all of the water will be pushed out of your crab terrarium leaving it with fresh air. On the other side of the clear terrarium is the water from your fish tank, fish and all. Sound amazing? It is. This is a must for any fish tank and definitely a necessity for anyone who has semi aquatic animals. So, it might not be a true definition terrarium where your animals stay in the small space for their entire lives. But, with the Atlantis Underwater Island crab terrarium your animals are able to leave as they please to go swim with the fish and explore your fish tank.